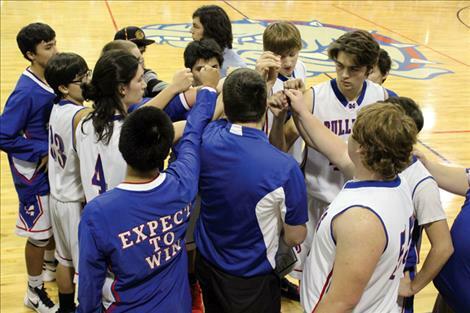 The Mission Bulldogs huddle before Friday’s home game against Ronan. Mission’s Tyler Spidel pushes to the hoop during Friday’s home game against Ronan. 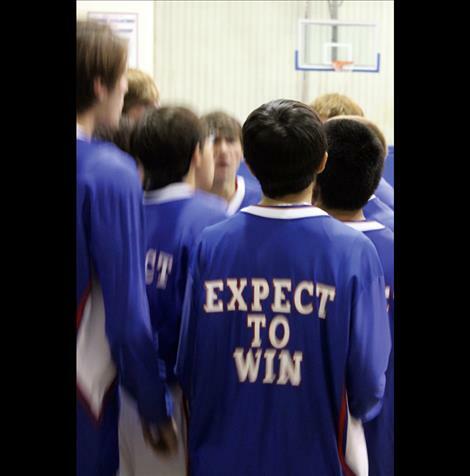 The back of every Mission Bulldog’s warm-up jersey reads “expect to win,” and despite their Friday, Jan. 22, home loss against Ronan, it was apparent to all fans in the gym that each member of the team played with that intensity all four quarters. 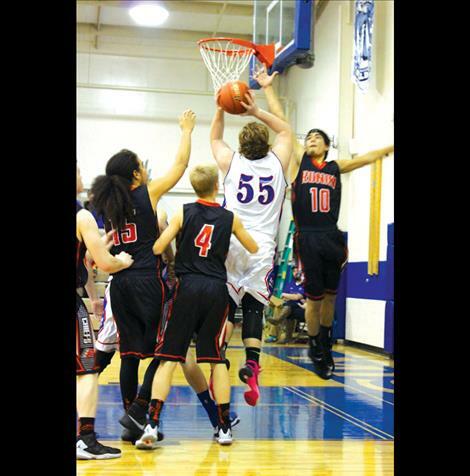 In fact, they out scored Ronan by six points in the fourth quarter, narrowing the margin in their 59-69 loss. Mission senior Tate Weingart, who had eight points o the night, is not looking at the Bulldogs’ 0-10 record for the season. He is looking forward to bettering the team each time they step on the floor, whether at practice or a game. Weingart is one of seven seniors on the Bulldog roster. He contributes their chemistry on the court to their friendship that has grown through the years. Mission Bulldogs’ Head Coach James Lozeau feels the same way about this senior class. The senior class, along with Weingart, includes Nick Durglo, Andrew Esslinger, Billy Von Holtum, Emilio Bravo, Tristen Elverud and Tyler Spidel. With eight games left in their final season, Lozeau and Weingart are looking to polishing up on some of the squad’s skills in the next half of their season. Weingart said they are also working on each player touching the ball before anyone shoots. The first half of their season is behind them and the Bulldogs have set goals for the second half of the 2015-16 season. “We are looking forward to getting some wins,” Weingart said. Coach Lozeau is eyeing postseason play. Leading the Bulldogs against Ronan was Durglo, who shot seven of his eight shots inside the three-point line, scoring 19 points on the night. Other key players were Von Holtum with 16 points and junior Isaac Alexander with 7 points. Looking for their wins, the Bulldogs are on the road their next two games as they travel to Florence on Thursday, Jan. 28 and Eureka on Saturday, Jan. 30. Ronan – Points: Zeke Misa 13, Aaron Misa 13, Kasey Mock 12, Perry Panzetanga 9, Elijah Cahoon 7, Ty James 7, Jackson Duffey 6, Isaiah Arrow Top Knot 2. 3-pointers: Duffey 2, Panzetanga 1. Assists: Z. Misa 7, Mock 4, Panzetanga 3, James 2, Duffey 1, Camel 1, Cahoon 1, A. Misa 1. Mission – Points: Nick Durglo 19, Billy Von Holtum 16, Tate Weingart 8, Isaac Alexander 7, Tyler Spidel 5, Emilio Bravo 2, Kaleb Durglo 2. 3-pointers: N. Durglo 1, Weingart 1. Assists: Alexander 3, N. Durglo 2, Andrew Esslinger 1, Spidel 1.